I was reading the serverfault.com blog today using Firefox - normally I just consume the RSS and read it from my reader. 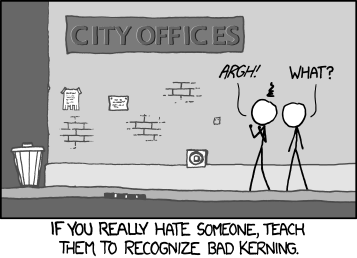 I was shocked at how bad FF was as at kerning the h3 headers. In Chrome and IE9 it is legible, though many of the letters still actually touch. The source of the rule is in style.css line 61 (at the time of this posting) and the offending property is letter-spacing. I would like to suggest getting rid of letter-spacing entirely, though experimenting with the text-rendering or other attributes might be of value. And it helped quite a bit, while still tightening up the kerning. Other thoughts? Is there a better place to talk about this? Update: While I still maintain the negative letter-spacing makes the heading look worse than letter-spacing: auto, I did some additional comparisons and FF on XP is by far the worst. On Win7 all three browsers look pretty close to the same. Disclaimer: I recognize I am being excessively picky. I didn't know (or had totally forgotten) there is a blog. You're right about it looking crappy in FF on XP. The letters look like they're being just a little too friendly with each other, with some of them looking like they might be mating. This is a problem with FF, using the suggested modifications would adversely effect every other browser. Not the answer you're looking for? Browse other questions tagged discussion feature-request status-declined design . Excessive amount of queries on ServerFault Blog?